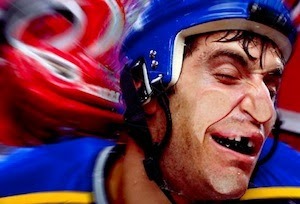 Whether you play football, hockey, or any other contact sport, don’t get in the game without a mouth guard. This is a piece of molded plastic that protects the upper row of teeth. Without it, your teeth could get chipped or even knocked out when the action gets rough. Self-fitting mouth guards may be purchased at a store, or you can have one custom made by your dentist. Posted in dentistry, mouth guards, sports mouth guards.